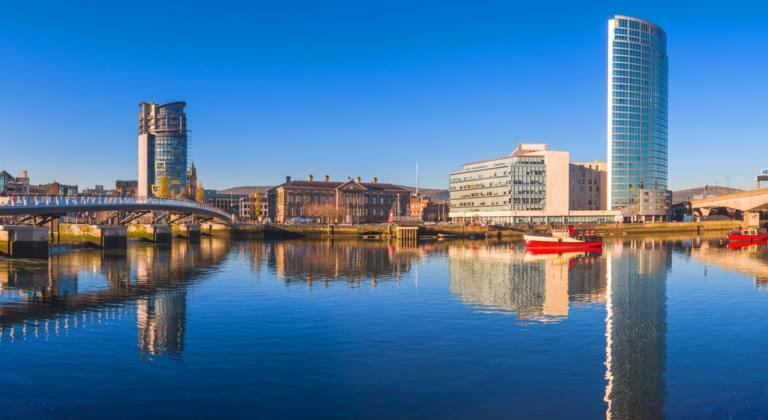 Located in Northern Ireland, the city of Belfast is a perfect spot to explore with a rental car. Belfast is the capital of Northern Ireland and is the second largest city of Ireland, right after Dublin. The city certainly has a lot to offer and is worth a visit. This exciting metropolis is full of sights and impressive history. Belfast amazes and impresses with many exciting places that attract tourists from around the world every year. The easiest way to travel to Northern Ireland is by plane. A flight from England for example from London it is just over one hour. Belfast has two airports: Belfast International Airport (BFS) and Belfast City Airport (BHD). The international airport can be found 21 km outside of the city. From there you can easily reach Belfast city centre with your rental car. Belfast City Airport, on the other hand, is located right in the city - only 5 miles from the city centre. What are the speed limits in Belfast? What insurance should I choose for my hired car in Belfast? The terms of insurance vary from one car rental company to another. However, for your own protection, no matter where you go, you should always choose fully comprehensive insurance without excess in case of an accident, damage or theft. What are the emergency phone numbers in Belfast? Since the Belfast area offers many attractions, the best way to enjoy the surrounding area is to take a trip with a rental car. On the southern outskirts of Belfast, the Lagan Valley Regional Park stretches along the Lagan River. The park links Belfast with Ireland's third-largest city, Lisburn, 20 kilometres south of the Northern Irish capital. It is characterized by picturesque landscaped gardens and houses a number of historic sites. Even quicker, in only 15 minutes, you can also reach Bushmills. Here, the world's oldest distillery has been producing the finest whiskey for 400 years. You will be introduced to the secrets of traditional whiskeys on site, and taste the different vintages. With your hired car, you can be in Downpatrick in only 30 minutes. Close to the city, the famous St. Patrick founded the first church in Ireland, in a barn, and consecrated the first holy springs of the country. There, you can also admire the well-preserved antique bathhouses with complex irrigation systems. A place that is definitely worth seeing in Belfast is the Donegall Square. It features imposing buildings such as the Neoclassical style town hall, built around the turn of the century. Another attraction is the 12th-century Belfast Castle, just outside the city, on Cave Hill. Also worth visiting are the Grand Opera House and St Anne's Cathedral. The Belfast Zoo has 1200 animals, and is a great day out for the whole family. However, those travelling with friends might enjoy the busy nightlife of Belfast that has to offer. A beautiful pub in the city is the Crown Bar, whose Victorian-style exterior hints at the impressive ambience inside.